If I could do it so can you! If you don’t want to enter the competition and only do the Challenge you can buy the products separately. There are great specials available and I would suggest you buy the combo packs for they work out much cheaper in the end. Next: So lets do a quick breakdown on each product explaining the function of each supplement. Before I begin it is so important to know your supplements and what you put into your mouth. Why do I use USN? First of all I must give them credit on their AMAZING customer support and advice. Gareth Powell from USN has been of amazing support throughout my Challenge. All my questions have always been answered and more. So before I go any further thank you Gareth and the team at USN for making each customer/individual feel valued as a client and for the exceptional products! 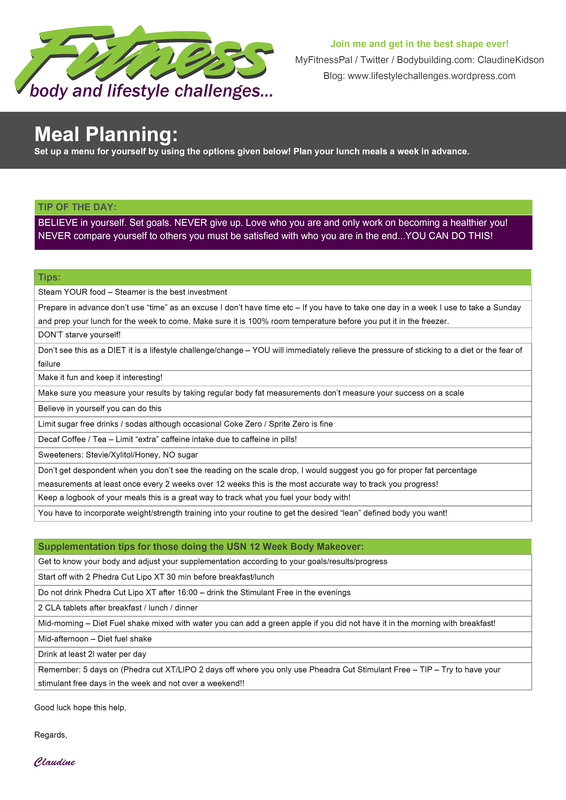 Trust me even though this is allot of information make the time to read through it and get the foundation right of your knowledge beforehand. A daily multi-vitamin designed for the female who requires an essential supplement for a balanced, nutritious diet. 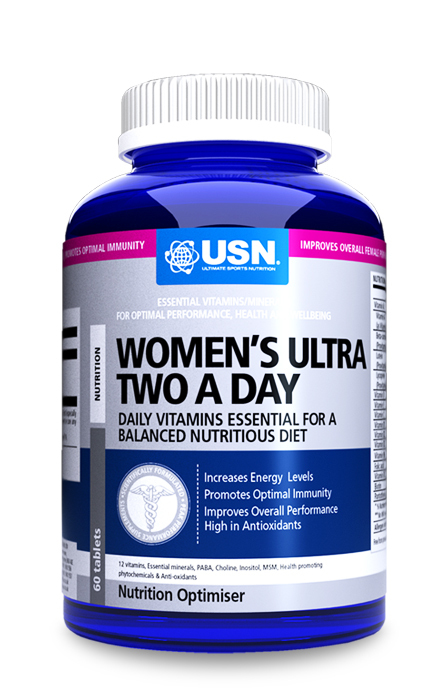 USN WOMEN’S TWO A DAY is a scientifically formulated, nutrient rich multi-vitamin/multi nutrient, designed for the active female who has specific micronutrient demands for the continued maintenance of good health, immune support and energy availability. A combination of Omega-9 (mono-unsaturated fatty acids) and Omega-3 and -6 (poly-unsaturated fatty acids). Omega-3 and -6 are Essential Fatty Acids (EFA’s). 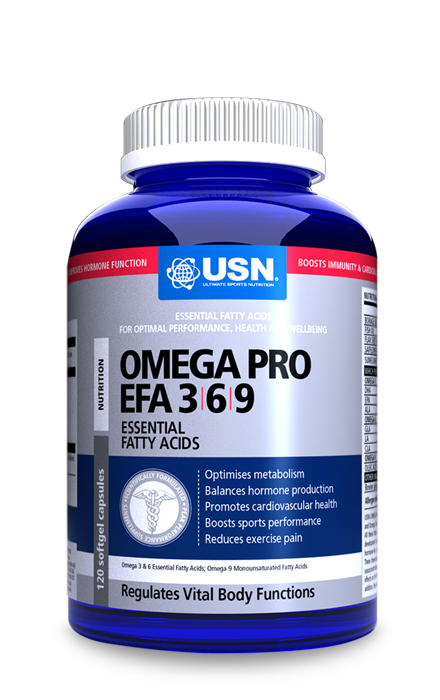 USN OMEGA PRO consists of a combination of Omega-9 (mono-unsaturated fatty acids) and Omega-3 and -6 (poly-unsaturated fatty acids) – Omega-3 and -6 are essential fatty acids. All these fatty acids are necessary for the formation of healthy cell membranes, the proper development and functioning of the brain and nervous system, and for the production of hormone-like substances called eicosanoids (thromboxanes, leukotrienes, prostaglandins). These chemicals regulate numerous body functions, including blood pressure, blood viscosity, and vasoconstriction, immune and inflammatory response. They have profound beneficial effects on the body an influence hormone production, immunity and cardiovascular health in addition, they keep the skin and other tissues youthful. Phedra-Cut Lipo XT provides all the benefits of the Phedra-Cut Ultra XT, but now includes a patent-pending encapsulated form of premium, highly concentrated natural capsicum extract, Capsimax™, which protects the esophagus and gastric barrier from the burn often experienced with cayenne pepper and its extracts. Due to the protective nature of this encapsulation, a higher quantity of capsicum actives form part of the formula, making it even more effective as a weight control aid. 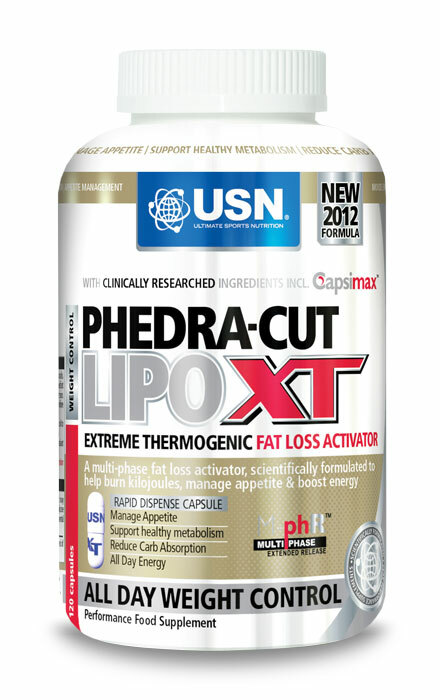 USN’s Phedra-Cut Lipo XT is an advanced fat loss activator, consisting of a synergistic blend of botanical ingredients, which have proven to assist in effective weight control.Not recommended for pregnant/lactating women. As a dietary supplement, take 2-3 capsules 2-3 times daily, 30 minutes prior to meals/snacks. If training early morning, take 2-3 capsules prior to workout, and then follow with breakfast directly after training. Phedra-Cut Lipo XT is not recommended after 4pm.Take Phedra-Cut Lipo XT for 5 consecutive days of the week and stop use for 2 days before continuing again (2 off days).Optional: Take 3 capsules Phedra-Cut Stimulant Free 30 minutes before your evening meal to prolong the weight control process to an even greater extent throughout the evening. During the 2 off days of not using Phedra-Cut Lipo XT, it is advised to use Phedra-Cut Stimulant Free 2 times per day, 30 minutes prior to meals. An advanced, multi-phase extreme thermogenic, fast activating fat loss activator, scientifically formulated to rapidly increase fat metabolism, appetite suppression and to boost energy production. 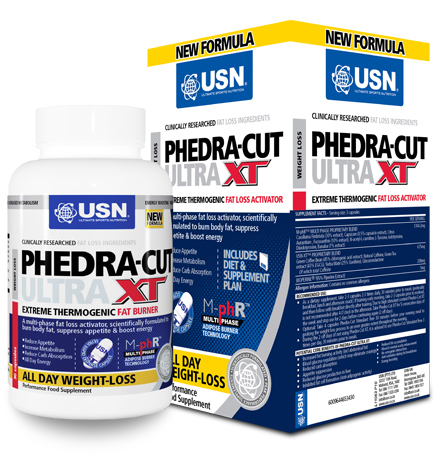 PHEDRA-CUT ULTRA XT is an advanced fat loss activator, consisting of a synergistic blend of natural ingredients, which have all proven to assist in safe and effective weight loss. A non-stimulant primary weight loss supplement designed to optimise the metabolic pathways associated with increase fat and carbohydrate metabolism without increasing thermogenisis or central nervous system activity. 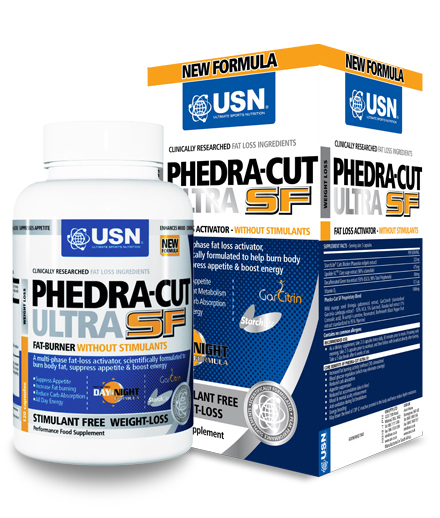 PHEDRA-CUT ULTRA SF has been formulated for individuals wishing to achieve optimal weight-control and energy levels, without central nervous system stimulation. It can also be used in combination with Phedra-Cut Ultra XT to continue the weight-regulating process during the night as well as over weekends. May lower the level of CRP (C-reactive protein) in the body and hence reduce leptin resistance. A non-stimulant weight loss supplement that supports weight loss and the metabolic processes involved with fat burning. 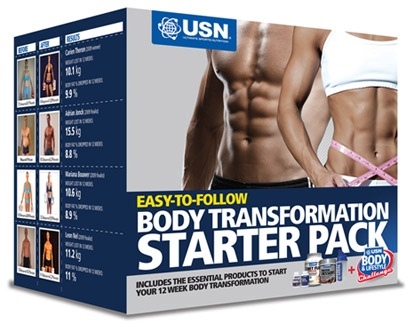 With further health benefits including blood sugar regulation to promote a lean physique. Conjugated Linoleic Acid is seen as a “wonder nutrient” that occurs naturally in a wide variety of foods such as beef, some dairy products and turkey. This “wonder nutrient” has been scientifically proven to inhibit the process that is responsible for the deposition of fat in the body (especially in the abdominal and leg areas). CLA directs the body to use fat reserves for energy. 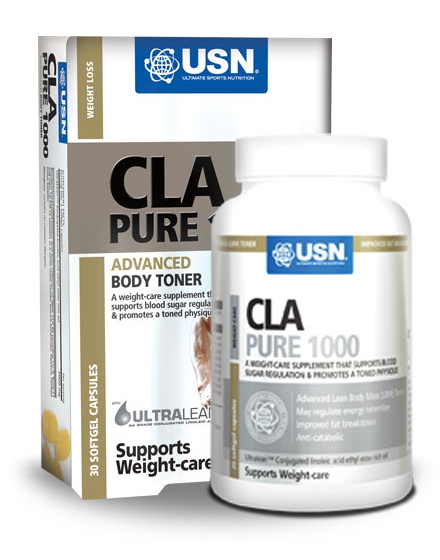 Research has shown CLA to increase lean muscle while reducing body fat. A number of other studies also revealed dramatic cholesterol-reducing effects with CLA supplementation. USN CLA 1000 primarily provides the Cis 9, Trans 10 and Trans 11, Cis 12 isomers in a 50:50 ratio, as recommended for optimal efficiency. Supplementing with CLA should result in a leaner, healthier body. With or directly after meals. 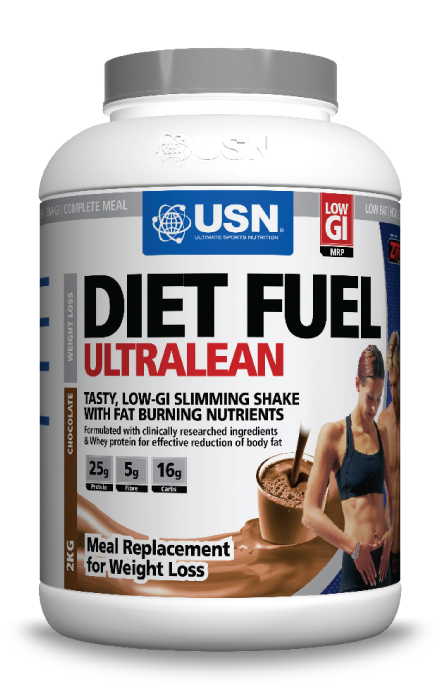 USN DIET FUEL ULTRALEAN represents the newest and most advanced technology for the reduction of body fat as well as the maintenance of lean muscle tissue. This delicious, low-GI, low-kJ meal replacement formula provides you with a complete, nutritious meal for anytime of the day. It contains all the essential nutrients in adequate quantities to ensure healthy and lasting weight loss. The USN Lean System™ blend consists of N-Acetyl-L-Carnitine, HCA (Hydroxycitric acid) and a high level of bio-available Calcium, which has been shown to assist the weight-loss process through various effective mechanisms (excluding central nervous system stimulation). The formula has a high fibre content to increase satiety levels and to assist with digestion. The reduction in hunger is further promoted through the addition of 25g High Biological Value Protein from various sources, which triggers a natural weight loss hormone (PYY) in the body. 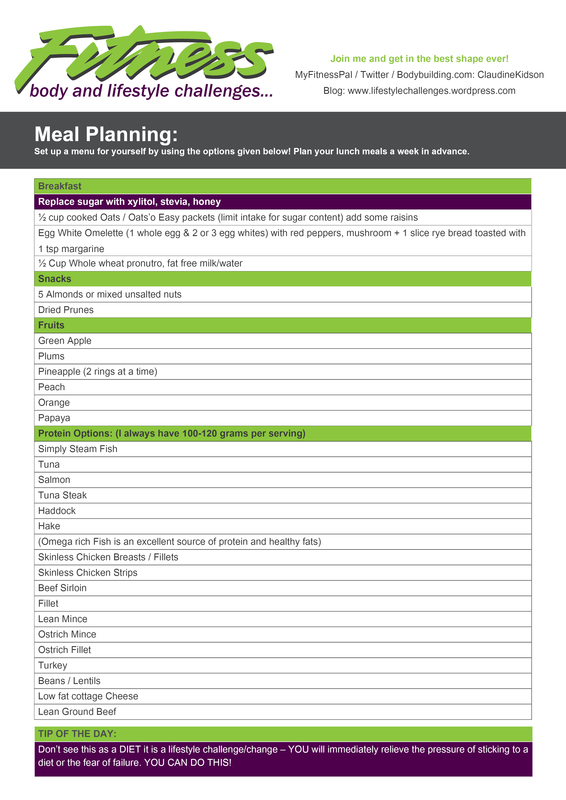 The high quality Protein substrates also assist in improving Protein synthesis, regulating blood sugar levels to reduce cravings and improving overall health. Lactazyme™ is added to assist in the breakdown of Milk Protein and improved absorption. Remember to take your first “BEFORE” photos with your measurements the day you start your challenge. I’m here to assist you if you have ANY QUESTIONS. 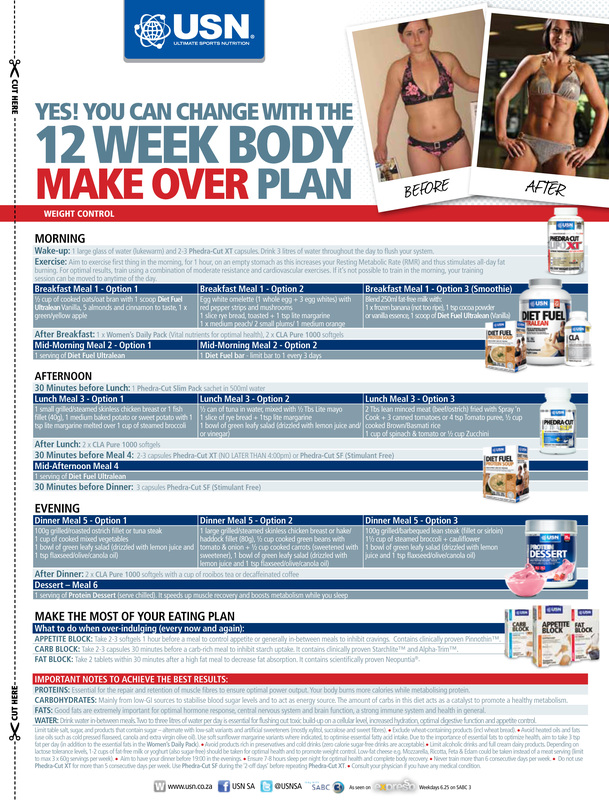 My 12 week training program as almost done for those who will be interested. Take on this Challenge you CAN DO THIS, you will never ever look back. 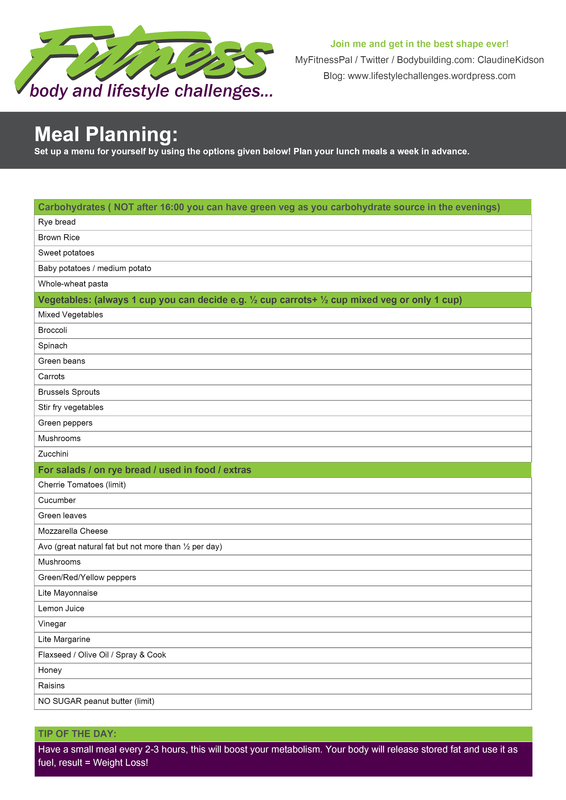 Click on the image to download your diet for your fridge!